Candidate age should be between 21 to 40 years as on 01-07-2013. Age Relaxation is applicable as per rules. Candidates has to pay Rs.500/- for General/ OBC candidate, Rs.200/- for SC/ ST candidates through Janapad, Sachiv, U.P. Basic Education Parishad, Allahabad by any Janapad branch of State Bank of India. There is No fee for PH candidates. 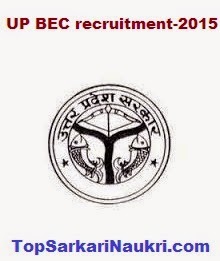 Interested candidates apply through online website www.upbasiceduparishad.gov.in from 24-12-2014 to 06-02-2015. 4. At the same time download or take print of E-Challan and make the payment through SBI. 5. After 2 working days revisit the website and fill the remaining application. 6. After filling application recheck the form and click on the “Final Submit and Lock”. Starting Date for Online Registration: 24-12-2014. Closing Date for Online Registration & e-Challan Generation: 06-02-2015. E – invoice form and application fee by SBI bank: 10-02-2015. Last Date to fill online Application Form: 05-03-2015. Date of Error Corrections in Application Form: From 06-03-2015 to 10-03-2015. Date of Counseling/ Verification in Janapad: 10 days after the closing date.